A PhD in Animal and Dairy Science can be focused on growth and developmental biology, quantitative genetics, bioinformatics, meats or muscle biology, nutrition and/or reproductive physiology of animals (cattle, horses, swine and laboratory animals). Dissertation research programs are applied at improving food animal productivity, profitability and sustainability or using animal models for human research applications. ï¿½State of the artï¿½ facilities, laboratories and equipment are in place for in depth research training in all program areas. Specialized areas of interest include a core facility for genomics and/or proteomics, a meat science technology center including abattoir and laboratories, core laboratories in ruminant and monogastric nutrition, environmentally controlled large and small animal facilities on campus and beef and dairy cattle, swine and horse research and teaching farms located near campus and at the Coastal Plains Experiment Station in Tifton. This is a dissertation degree program that requires a total of 30 h of graduate credit including 24 h of course work, more than 16 h of courses intended for doctoral students ( >8000 level ) and a minimum of 3 h each of doctoral research and doctoral dissertation. A minimum of 6 h of doctoral level coursework (>8000) in biochemistry, cell biology or genetics and 6 h of statistics is required in the program of study. Other courses in the program of study include courses in animal nutrition, biochemistry and molecular biology, crop and soil sciences, poultry science, genetics, cell biology, microbiology, statistics, veterinary physiology. The dissertation consists of a literature review and a least two to three manuscripts suitable for publication in a scientific refereed journal. Dissertation research for a PhD in Animal and Dairy Science can be focused on biotechnology, genetics, meats or muscle biology, nutrition or reproductive physiology of laboratory or farm animals (cattle, horses and swine). The program leading to the PhD degree in animal nutrition is also available to animal and dairy science students. There are approximately 20 graduate faculty and 40 graduate students in the Department of Animal and Dairy Science. Several graduate faculty and their graduate students are located at the Coastal Plains Experiment Station (CPES) in Tifton, GA. Collaborative research programs exist with USDA Scientists and research faculty from other Departments. Modern facilities, laboratories and equipment are in place for in depth research training in all program areas. Specialized areas of interest include a core facility for genomics and/or proteomics, a meat science technology center, environmentally controlled large and small animal facilities on campus and beef and dairy cattle, swine and horse research farms located near campus and at CPES in Tifton. Research and teaching assistantships are available to qualified candidates based on availability of both departmental and research grant funds of individual faculty. 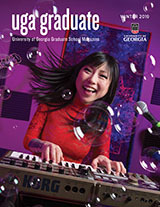 Students on assistantship support are eligible to receive a tuition waiver from the UGA graduate school. Prospective graduate students who desire financial aid may apply for assistance directly to the Graduate Coordinator or individual faculty of the animal and dairy science department.